While satellite television has in large part migrated to digital, a digital solution may not be for everyone. 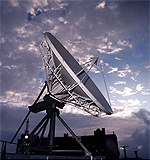 There are many who have found their best fit utilizing C Band satellite systems, and this might be the right choice for you! If you are already utilizing a C Band Dish for your commercial property and looking for programming content, we can help with that as well. Virtually every channel imaginable is available via C Band, and there are no transport fees which helps to keep programming costs low. Contact us today to receive our recommendations regarding C Band equipment and programming at your property!